It has been a couple years since I last visited Miyajima, and I was excited to return to an area that I found to be the most beautiful place in Japan. Since I last visited, I have made visits to the other three Top 3 Views of Japan, and I still think it’s the most beautiful of the three. I have been to various areas including a trip around Shikoku, and a trip to the San’in area, and I still think Miyajima is beautiful. While the natural beauty wasn’t as special this time around, the actual island didn’t disappoint me too much. The second time around was not as good as the first time, but it was still great to say the least. 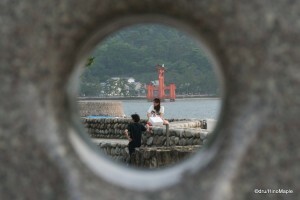 The first time I went to Miyajima, I went on a busy weekend. I had time to see almost everything, and I did almost everything. One of the main places I wanted to visit was the top of the mountain. I enjoyed my trip up a rickety ropeway but this time, I was burdened with a choice to either hike up or not go to the top as the ropeway was closed. I didn’t mind too much, but with the hot weather and the fact that I had been travelling for about a week already, I wasn’t up to the challenge of hiking up to the top. Especially when I knew I would have to rush a little to get things done. Instead, I decided to relax in the village and just absorb the atmosphere. 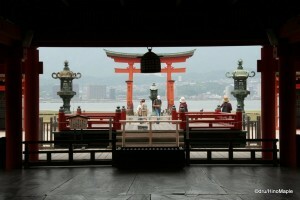 The first thing people should be doing is head straight to Itsukushima Jinja and the Torii. It’s a short walk and you can see it from the ferry as you approach Miyajima. The walk over on the weekend can be extremely busy with tourists taking up every available piece of real estate. It’s a simple walk to get to the torii, and the best location for the view is generally reserved for those on tours. They set up a set of benches/steps for groups of 10 or more to join together for a photo with the torii. This area is the best for photos as you can see the torii with the main island in the background. Like my last trip, I arrived at low tide, so I immediately made my way out to the torii. Unlike last time, there were only a few people around the torii. I was able to get more photos and not worry too much about getting in the way of other people. Nothing had changed at all. The gate was in the same location, with the same paint. Although the paint did look a little older, it was still an amazing sight. From there, I went into the shrine as it is a must see, even for a second time. I headed in and felt that things were different. With less people, pictures were much easier to take. The only sad part was that there wasn’t a wedding happening this time. I did get more time and things went much faster as there were very few people in the shrine itself. Do be aware that on weekdays, while there are fewer tourists, there are hundreds of school kids taking educational tours of the island. It’s tough to get around, but if you just wait a few minutes, they’ll soon pass. The peak of these tours occurs around noon and in the early afternoon. 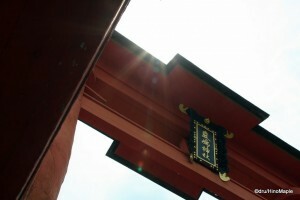 Afterwards, I headed over to a few of the other shrines in the area before my major task of the day, shopping! 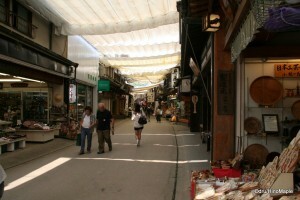 I spent nearly the entire day in the shopping street of Miyajima. Miyajima is famous for its wood products. I have mentioned that Miyajima has the largest wooden rice spatula in the world. You can still buy wooden rice spatulas (obviously not the largest one) as well as other wood products. Finding things such as wood bowls and cups are harder to find, but chopsticks and chopstick rests are easy. I was also introduced to an interesting character that looks a bit like a bald Buddhist monk. Of course, they have the typical tourist goods such as t-shirts, pens, and whatnot. I also had a lot of time to think about my gifts for friends. Miyajima is the best place to buy momiji manju. It’s a maple leaf shaped “pancake” with a sweet filling. Typically, you’ll find red bean paste or custard, but in Miyajima you can also find macha, chocolate, and cheese. There are a lot of flavours to choose from and I highly recommend trying them all. I went to one famous shop that was recommended by the Japanese travel books. The shop is easy to find. It is the only shop that sells cream cheese filled momiji manju. It can be easy to miss, but if you are looking for it, you will find it. I also had a chance to eat in Miyajima. It was the first time I had deep fried oysters. Hiroshima is a region well known for its oysters. They typically grill oysters in their shells and you can buy them for a few hundred yen each. Being a weekday, these oysters were a little scarce, so I decided to go into a small restaurant and order a fried oyster set lunch for about 1000 yen. I don’t normally enjoy oysters, but this time, it was delicious. It was dangerously hot and I nearly burnt my tongue, but somehow, they got me to enjoy it. 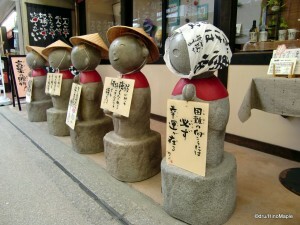 Miyajima is also famous for its Anago, or salt water eel. While it wasn’t in season, it was still a specialty of the area. I can eat oysters, but I can’t eat eel, so I didn’t get a chance to try it. While I was in Miyajima, I had a chance to run into a small liquor shop. Of course it was focusing on souvenirs, but liquor was still a major presence. Hiroshima is not well known for its liquor, but there is one brand of liquor that I generally recommend. Kamotsuru is an old brand of sake that is somewhat well known in Japan, but well known in Hiroshima. It is one of my favourite brands of sake and you can pick up bottles of it easily in Miyajima. I was lucky to meet the store owner who gave me a little information (in Japanese) about the different varieties of Kamotsuru. While I would recommend trying to speak a little with her, it’s best to wait until you are at Hiroshima Station and at a department store to get information as store owners in Miyajima have very limited English skills. I have talked with many shop clerks about sake, so it’s easier for me to understand what they are saying. Essentially, just buy what you want and hope you have the right type. Miyajima is a wonderful island that will always leave me wanting more. I would love to be able to visit it again when the tide is in, and to go back to the peak of the island. It’s hard to find the time to go to Hiroshima, but I’m sure I’ll go back again someday. If you ever make it to Hiroshima, it is a shame if you don’t visit Miyajima as well. It’s not that close, but it is close enough that an extra day would not hurt. This entry was posted in Chugoku and tagged deep fried oyster, grilled oysters, Hiroshima, Hiroshima-ken, Itsukushima jinja, Itsukushima Shrine, japan, Japan's Top 3 Views, Kamotsuru, Miyajima, Momiji Manju, oyster, oysters, San'in, Shikoku, Top 3 Views, Torii, カキ, 厳島神社, 四国, 宮島, 山陰, 広島, 広島県, 日本 by Dru. Bookmark the permalink.